Karachi is a very tropical area in Pakistan. There are many beaches in Karachi, which increases the beauty in this big city. People from all over Pakistan come to Karachi for the beaches. The most popular beaches are Clifton Beach, Hawke’s Bay, Sandpit, Cape Mount, Tushan Beach, Paradise Point, Nathia Gali Beach, Devils Point, Turtle Beach, French beaches, etc. People come to these places and do different types of entertainment. There are malls like Hyper Star and many restaurants and hotels for food-lovers. But in this article, I would like to highlight a special kind of entertainment that is animal riding. When people go to these Karachi beaches, there are horse and camel owners walking with their animals for riding. These animals are decorated in classic styles of Sind culture using beautiful mirror work on the seats, which is put on the animal for sitting purposes. The decoration on the animals definitely attracts crowds at the beach.Children, adults, and families enjoy riding animals for very reasonable fees, and the owners treat these animals well. It is very difficult to realize that these animals are trained by people who are uneducated, but they do manage to train them well anyways. 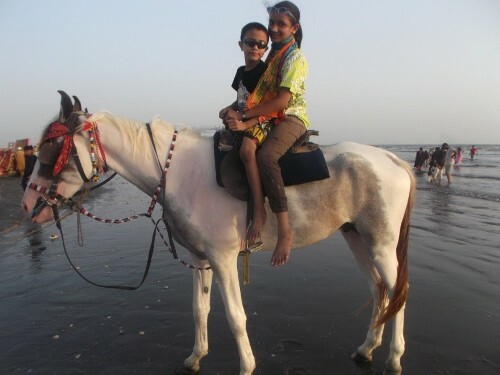 Whenever I go to Karachi Beach, I enjoy animal riding. In my opinion,the government should keep and enhance the traditional riding of animals at the beaches. It attracts tourists, and even locals enjoy these traditions.